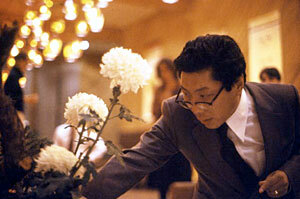 When Chögyam Trungpa Rinpoche discovered ikebana, he immediately perceived the profound potential of this discipline that can teach people about the five elements, natural hierarchy, and constant flow and change in life, all of which he was deeply versed in from his traditional training in Tibet. He saw that practicing in this way, people could uncover their basic wisdom through the placing of branches and flowers, through respecting what is already there, and through proper training that observes and understands nature’s universal laws. He taught ikebana to demonstrate the brilliance of letting go–bravely cutting all unnecessary clutter so that any plant or human could be their best. He understood the secret of nature, that of not forcing, manipulating, or intimidating, but rather simply allowing patient cultivation coupled with accurate pruning when necessary. If you encourage people to find their way through self-exploration, experience, meditation, and study, their chances are greater to rediscover innate primordial wisdom. This is natural hierarchy in action, inborn wisdom sensed, recognized, and followed. But like everything in life it takes effort and time. The kado path does not promise a smooth easy road with a guarantee of success. Because Rinpoche often made an ikebana to accompany his lecture, or the ikebana was the lecture, the tradition began to appear in Shambhala. Authentic ikebana is an expression that needs no explanation. It simultaneously communicates truth, delight, power, and wisdom on the spot. It is “wisdom beyond words.” It is the teacher with no teacher. Chögyam Trungpa knew properly taught ikebana was a gentle yet uncompromising way for westerners to discover the power of space with its undeniable place and necessity in relationship to form. And not just to discover omnipresent space, but to recognize that what forms we put in space, where, how, and when, makes all the difference in the world, our world, which we create moment by moment both separately and in community. If we humans can truly sense-feel nature, understand her, both inside ourselves and out side, appreciate all her expressions and follow her knowing, she is the supreme nonhuman master to learn from. She does not lie, she does not compromise. She illuminates and activates that which supports and nourishes balanced life, and discards that which does not. 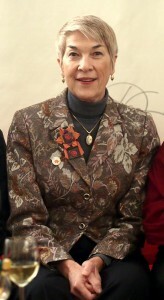 A properly executed ikebana is a synchronicity of the five elements and expression of natural hierarchy. It seems to be not moving, still like a painting, but is completely alive. It is balance via asymmetry, a perfect relation of space with form, impermanent, imperial, timeless, elegant, offering all but making no demand. It continues to change after it is complete because it’s an expression made from live forms that continue to give subtle communications slowly on the way to death. It can be a complete manifestation of enlightened expression in any moment. It confirms basic goodness, basic wisdom. This is a lot to say about plant materials in a dish of water, but when the greater view is understood, a properly executed and understood classical Ikebana expression (or a properly executed open form ikebana ) can be an excellent example of awakened good life. Humans, like all of nature’s expressions, are born with the gift of basic goodness, basic wisdom. Thus it is possible we can live our life fully, with kindness, clarity, balance and appreciation for all. We could be awake each moment as nature always is. That is what Chögyam Trungpa Rinpoche taught us and that is why we have ikebana arrangements in Shambhala centers around the world—to wake us up to our own and others’ natural primordial wisdom, goodness that comes from the basic ground of space. thank you for this extended article on Ikebana. Helped understand the View as a contemplative art practice. I am wondering what is the difference – if any – between Sogetsu and Rigden schools of Ikebana?